Part of the large molecular cloud known as the Cepheus Bubble, IC 1396 is an HII region of star formation. The nebula is visually quite large, spanning three degrees in our nighttime sky. The entire nebula is illuminated by the hot blue supergiant at the center of the nebula. Within the nebula is IC 1396A - the Elephant Trunk Nebula (left side of the nebula in this image). 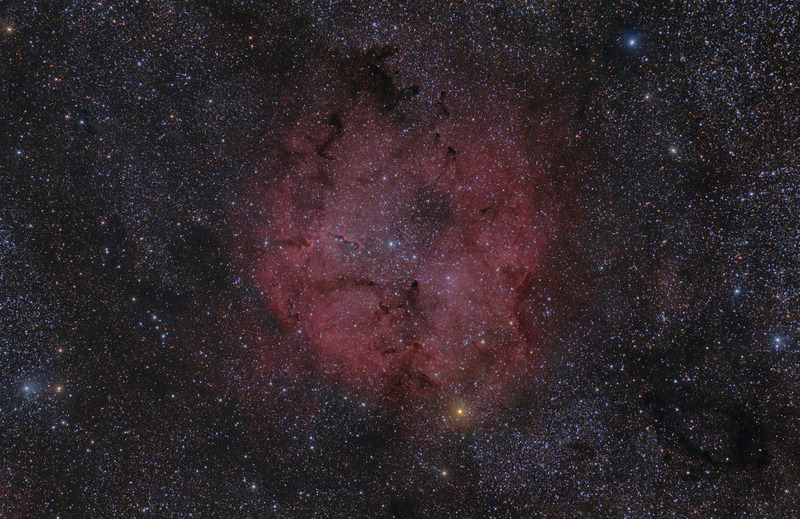 The nebula also contains numerous comet shaped Bok globules - the dark nebulae scattered throughout the field of view. The bright yellow star at the bottom of the nebula is the yellow supergiant, Mu Cephei. It is believed to be one of the intrinsically brightest stars in our galaxy. Software Used Images Plus 5.5 for camera control, calibration, stacking, and digital development. Images Plus 5.75 Beta for feature mask, star masking, smoothing and noise reduction, and star shrinking. Photoshop CS5 used for levels and curves, hue/saturation colorizing, hue adjustments, lab color, vibrance, match color, selective color, high pass filter, and unsharp mask. Gradient Xterminator for gradient removal. Registar for registration and stack alignment. Carboni Tools for additional noise reduction and smoothing. Focus Magic for focus restoration. HLVG for additional color adjustment. Notes This was one of the first images that I tried using Images Plus' new Feature Mask. This tool allows me to remove all of the stars from the image so that I have only the nebula left. Then, I can process the nebula (stretching, sharpening, etc.) without having to worry about making the stars bloat and have other artifacts. Then, I added the stars back into the image. While I still need to refine the process, I think the technique holds a lot of promise.